Planar cell polarity (PCP) is a phenomenon found in most, if not all, higher animals, in which the orientation of cells or the positioning of subcellular structures in cells that form a tissue is coordinated with the neighboring cells. For instance, the hairs on the wing of a fly all point in the same direction, and so do the hairs on the back of a mouse or the sterocilia in the hair cells of the vertebrate inner ear. PCP is controlled by an evolutionarily conserved group of genes and most, but not all PCP genes with a function in vertebrates also have a related function in the fruit fly Drosophila. One exception is the vertebrate PTK7 gene, which encodes a catalytically inactive receptor tyrosine kinase and is required for the control of PCP in frogs and mice. Mutation of a Drosophila homolog of PTK7, the gene off track (otk), was reported not to cause PCP phenotypes in the fly. We found that in contrast to previous reports, flies homozygous for a complete knock-out of otk are viable and fertile and indeed do not show PCP phenotypes. However, we discovered a second closely related gene, otk2, that functions redundantly with otk in morphogenesis of the male genital tract. We are currently investigating the mechanism of how otk and otk2 control the elongation of the ejaculatory duct. Otk and Otk2 are coreceptors for Drosophila Wnt 2 and we have started to analyze the downstream target genes regulated by this branch of the Wnt signaling pathway. We also study the function of Ror and Nrk, two additional Wnt coreceptors, in development of the nervous system in the fruit fly. Image 1. Subcellular localization of the Wnt coreceptor Otk in the embryonic central nervous of Drosophila. 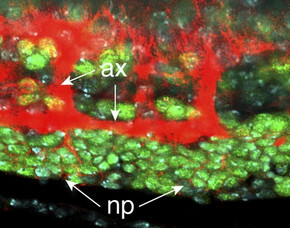 Otk (red) is expressed on axons and in the plasma membrane of neuronal cell bodies. Nuclei of neurons are marked by expression of Elav (green). DNA is stained with DAPI (cyan). Image 2. Embryonic expression pattern of the Drosophila Wnt coreceptor Ror. The coding region of the genomic ror locus was fused by recombineering in bacteria to the cDNA encoding EGFP, giving rise to a Ror-EGFP fusion protein expressed under its endogenous promoter. Imaging was done on a Zeiss Z1 light sheet microscope, kindly provided by Carl Zeiss Jena.